Sometimes you just have to get the Champagne flowing and celebrate! Sure - you might not be able to afford to wine and dine in London's top pie restaurants every week but we sure aren't going to hold back when the Pierateers are about to review their 250th pie on the web's leading pie review blog - www.pierate.co.uk! 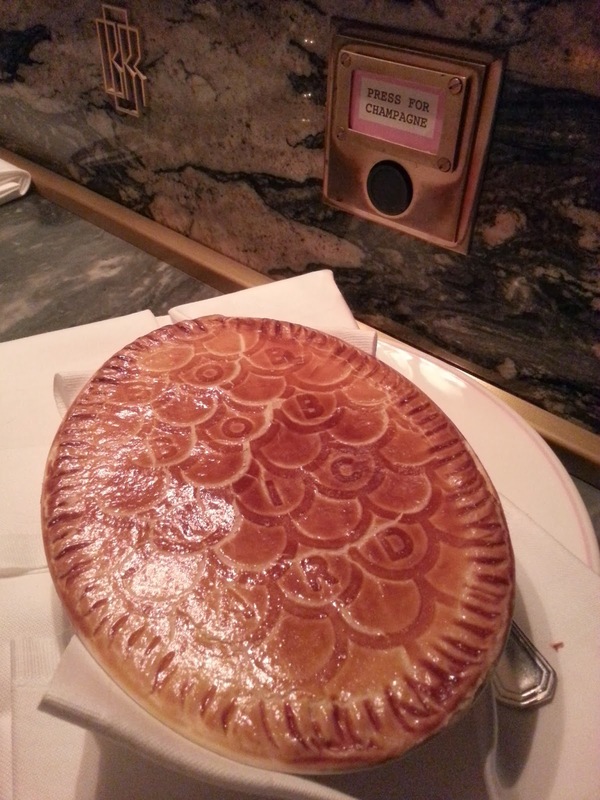 So when we got recommended the Chicken, Mushroom and Champagne pie at Bob Bob Ricard's in Central London, how could we say no?! The fact they also advertised a pastry topped fish pie (a rarity in this day and age) and a Humble Vegetarian Pie on their menu too meant the deal was pretty much done! Unfortunately, two days before pie night, Pierateers RAS and TJP received the disappointing news that Pierateer SJL had other commitments and wouldn't be able to join the party down at Bob Bob Ricard's. But the date had been set, the table booked and the pie requested online - in short, the show had to go on! So... dressed in elegant (but no tie) attire - no doubt the most posh we've ever looked going to a pie restaurant - the Pierateers set off for celebratory pie! 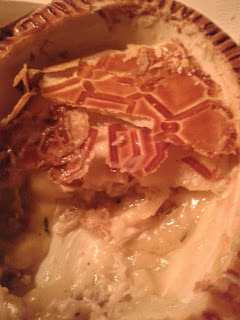 Pierateer RAS went for the Chicken, Mushroom and Champagne pie. With a very impressive top-crust placed in front of me, I had to pause to admire the golden crust and artistry of the top pastry before delving into the pie itself. The dish was well filled with large tender pieces of chicken and a unique, substantial sauce which complimented the meat well. It was clear they had put in the hard graft to perfect this sauce, as it wasn't like anything I had tasted before. 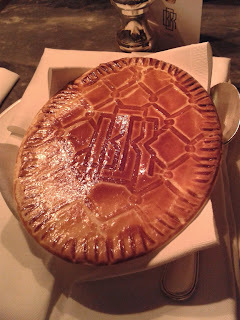 I had hoped I would be able to notice the difference the Champagne made to the pie and was certainly not disappointed! The content was top notch. 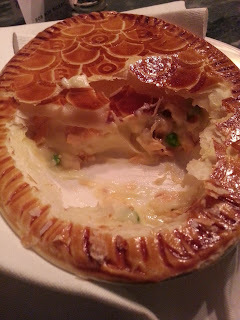 It would have been great (and scored a bit higher) if it had been fully encased in pastry but the pastry was very nice. Crisp on the top layer, slightly softer underneath. While the current Pierate budget sadly will restrict the number of Champagne pies I'm able to buy in the foreseeable future, the quality of service, the ambiance and the pure uniqueness of the pie at Bob Bob Ricard puts me in no doubt that this was a pie experience that will live long in the memory! Thank you Bob Bob Ricard! 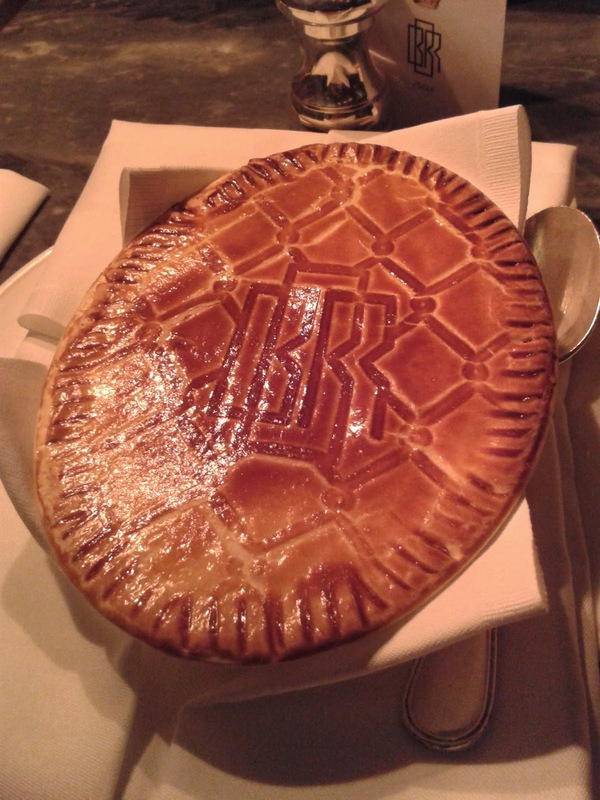 Pierateer TJP had this to say: Tucked away in London's Soho, Bob Bob Ricard's was certainly one of the most attractive restaurants that I've been to - and their 'Mariner's Fish Pie' was certainly one of the most attractive pies I've had the pleasure of setting my eyes upon. The fish pie is made with smoked haddock, prawns, mussels and salmon. It was very well presented, with an ingenious fish scale pattern and the establishment's name emblazened on the puff pastry crust. As this was a very special occasion - the Pierateers 250th pie review - we sort of ignored the cost, but as cheapness is very much part of the 'Seven Cs', I feel obliged to mention that this pie alone cost £16.50. But come on, this is a special occasion. How often do you get to celebrate such a milestone in pie reviewing? This pie certainly scored highly for condition and colour. The puff pastry lid was perfectly smooth, as flat as a calm pond on a perfectly still day. I could almost see my reflection in it. What little fishies would be swimming beneath the flat-calm surface? I cracked the lid open to reveal the content of the smooth creamy sauce and chunks of quality fish that broke away in my mouth and scored very well on chewiness. In terms of capacity, the air:filling ratio was good, with only a little layer of air beneath the crust. Of course, my fears were realised when I confirmed that this was indeed just a top crust pie, but this was a relatively minor fault considering the effort with the crust patterning. However, the Pierate rules of course mean that pies that aren't totally and wholly encased in pastry will have points deducted (a casserole in a dish topped with pastry is, yep, just a pastry-topped casserole, not a pie). On tasting the pie, the sauce was thick, delicious, and of the perfect consistency, and the pastry was wonderfully light and crispy. There was also an impressive selection of fish in the pie. Of course it's very rare for a fish pie to have pastry and not potato topping, as is the case with so many other fish pies out there. Overall, one of the most impressive settings to eat a pie and one of the most attractive pies (and also right up there on taste!) Score sadly lowered by cost and lack of pastry all the way round the pie.